Who would have guessed that the match opening the 2015-2016 European season would yield nine goals and a massive comeback, culminating in a Pedro winning goal in extra time, giving Barcelona a 5-4 win over Sevilla in the UEFA Super Cup, preceded by a brace from Lionel Messi in the first half. The first to score were Sevilla after less than three minutes, as Ever Banega struck a free kick perfectly to leave Ter Stegen viewing a goal and not for the last time in the match. But Barcelona didn’t really feel stunned or shaken by the goal. They won themselves a free kick three minutes later, and Lionel Messi opened his account for this season. Eight minutes later from even further away, and Messi already had his first brace of the season. Rafinha, starting for Neymar, scored another goal just before half time, and Luis Suarez, in the 52nd minute, put Barcelona 4-1 in front. That seemed to be the end of it, but it was only the beginning. A combination of slick passing and off the ball movement with pathetic defending and goalkeeping put Sevilla back in the match and sent it into extra time: Jose Antonio Reyes, a Kevin Gameiro penalty and Yevhen Konoplyanka, who came off the bench for Reyes, gave the fans in Tbilisi another 30 minutes of quality football. Pedro put Barcelona in front by pouncing on the rebound off of a Messi free kick in the 115th minute, but Sevilla still had two incredible opportunities from close range to score another goal and tie the match once more. 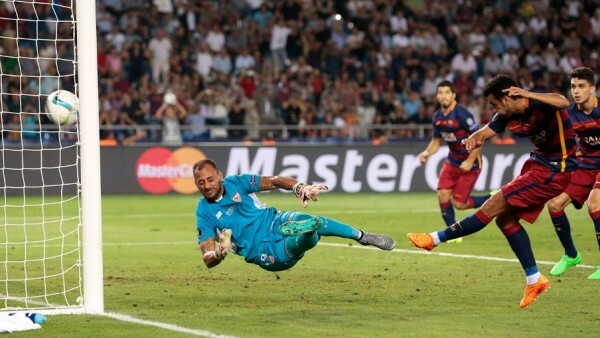 But Barcelona got lucky enough this time, despite their defensive flaws, to have Pedro’s goal be enough for them. Barcelona win the European Super Cup for the ninth time and first since 2011. It puts them on the path for the six-title quest like they did in 2009, with the next one being the Spanish Super Cup against Athletic Bilbao, with two matches in the next six days.